It's no surprise that the Portland Head Light, also known as the Cape Elizabeth Lighthouse, is the most photographed lighthouse in the world. Every view of this 18th century lighthouse is spectacular. The lighthouse took four years to build, with construction ending in 1791. The lamps originally used to power the light were of whale oil, replaced by an autobeacon in 1958. Situated in Fort Williams Park, the lighthouse has an interesting museum housed within the old Keepers Quarters. It is well worth packing a picnic and enjoy the beauty of the park and exploring the historic forts within its parameters. 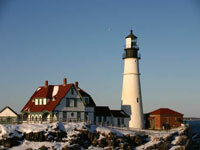 Portland Head Light closes during winter, but the park is open throughout the year and offers activities like cross-country skiing, sledding, and ice skating during the cold months. Opening times: Open daily 10am-4pm from late May to 31 October. Museum opening hours differ according to month, see website for details. Admission: $2 adults, $1 children 6-18.